While Armenia is trying to establish ties with the European Union, Russia is gradually tightening its immigration laws, and it is quite possible that very soon emigrational outflows from Armenia will be changing their direction. Russia has adopted a law according to which migrants from former Soviet countries beginning on January 1, 2015 will be required to enter the country only with so-called ‘foreign’ passports (as opposed to internal passports used within their own countries). They will be met at stations by immigration officials and will have to get registrations at immigration centers. At present, Armenia and Russia have a visa-free regime. The Russian government explains this decision by the high level of crime among immigrants from post-Soviet countries and the need to reduce the flow of migrants. At the same time, Russian President Vladimir Putin instructed immigration officials not to obstruct the entry of skilled professionals to the country. In addition, Russia is going to pass a law, according to which young male migrants will have to serve in the Russian army, even if they already served in the armies of their countries. This law is certain to deter many young Armenians from going to Russia. Meanwhile, Armenia intends to sign an Association Agreement with the European Union, which implies simplification of the visa regime. One related act was already signed by Armenia and the EU in December, but it has not yet been ratified by the European Parliament. As European experts say, there is a risk of a sharp increase in the number of Armenian migrants after the enactment of the agreement. At present, more than 90 percent of migrant workers from Armenia prefer going to Russia. About 85 percent of transfers in Armenia are also received from Russia, which provides almost a third of the consumer turnover in Armenia. Among those who go for work to Russia are mainly people who are ready to engage in construction, do unskilled work not always in very good conditions. Professionals in the field of information and other technologies choose to go to the United States. Students, as well as multi-lingual professionals try to get to Europe. 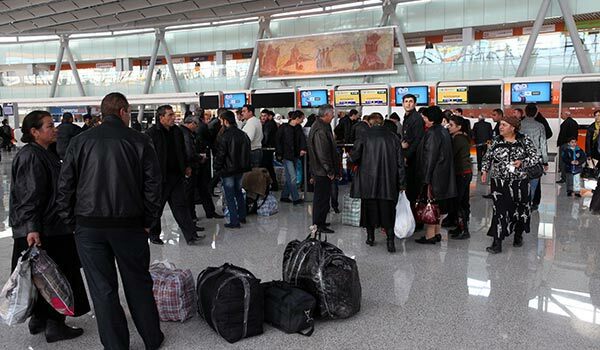 Emigration is becoming a major problem for Armenia, although Armenian authorities say that people thus have found a good way to support their families. However, many who go abroad, particularly to the West, no more want to come back, which affects family ties and changes destinies of people. Observers say Armenia itself should be interested in signing an agreement with Russia on the regulation of migration. Meanwhile, at present Yerevan appears to prefer not to deal with issues of emigration, leaving it all to the laws of the countries to where Armenians emigrate in search of work, opportunities or justice.